That may not sound like kid stuff, but I Declare War presents an arresting mix of fantasy and reality, transporting you back to a time when counting to ten could resurrect the dead, and all that mattered was the here and now. Co-directors Robert Wilson and Jason Lapeyre, working from Lapeyre’s script, drop us in the heat of battle right from the get go, as a group of 12 year olds is engaged in a very serious round of Capture the Flag. General PK (Gage Munroe) is out to remain unbeaten, while across the woods, General Quinn (Aidan Gouveia) plots an upset. Both leaders must deal with dissension in the ranks, and some surprises in the field, before a winner is declared. Wilson and Lapeyre contain the film in a glorious section of the outdoors, framing the action skillfully enough to give it an expansive, wide open feel, as if the opposing base camps were miles apart and expert cunning was required to keep from getting hopelessly lost. 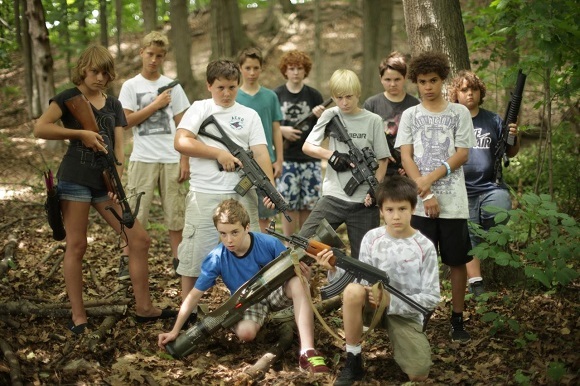 Of course, putting pre-teens in violent situations where sticks suddenly become rifles and POWs are subject to enhanced interrogation will quickly bring up a host of delicate social issues. Thankfully, the filmmakers deliver their commentary with a gentle touch, utilizing a terrific young cast to craft characters who, though a bit cliched in their respective roles, don’t reek of adult romanticism. You’ll recognize homages to Apocalypse Now, Saving Private Ryan and more, and as you find yourself caught up in a kid’s game, you’ll recognize a phase of life that’s bursting with both anguish and wonder.